Bar Breton located at 245 Fifth Avenue in NYC is one of the best restaurants I have tried in a while. They have an extensive list of gluten free items on their brunch, lunch, and dinner menus! The restaurant is brasserie-style and features food from Chef Cyril Renaud. One of the items they are most famous for are their delicious galettes. A galette is a buckwheat crepe traditional to Brittany, France. At Bar Breton they are gluten free and made with organic buckwheat flour! Gluten free options at Bar Breton include an extensive list of salads, galettes, fish, meat, eggs (for brunch), side dishes, and desserts! I also included a photograph below of another gluten free item, the Prosciutto & Parmesan Galette with Goat Cheese Creme, Red Pepper Confit, and Arugula! For more information visit www.chefpiano.com or follow Chef Cyril Renaud on Twitter @Cyril_Renaud. 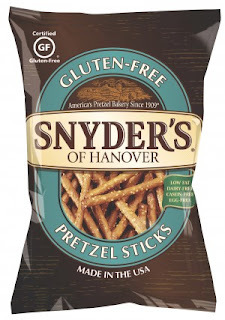 Snyder's of Hanover Releases Gluten Free Pretzel Sticks! 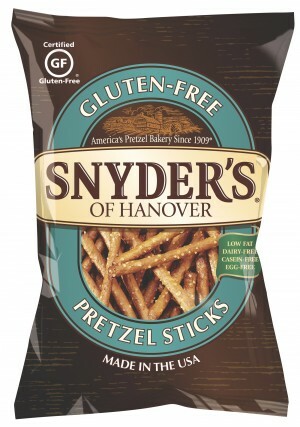 Snyder's of Hanover has been making delicious pretzels for many years. So, they decided to create a gluten-free version that is now available for purchase! Their Gluten-Free All Natural Pretzel Sticks are available at Whole Foods and select health food stores throughout the country. They are currently retailing for $2.99 for an 8 oz. bag. In addition to being certified gluten free by the Gluten Intolerance Group (GIG), they are also free of dairy, casein, and egg. This past April, Pizza by Cer te opened at 132 East 56th Street between Park and Lexington Avenues in NYC. It is Manhattan's First Green PIzzeria. What does that mean? Well, the building is LEED certified. They utilize rain water for non-consumption use. The food is delivered by foot or via hybrid truck. All of the supplies and food is purchased locally and the pizza boxes, utensils, and paper goods are made from recyclable material. One of the many selections on their menu is a naturally gluten free dish known as socca. Socca is essentially a provencal chick pea flatbread. They also give you the option of having it made into a panini. I enjoyed a specially made socca panini with pesto, chicken, and tomatoes (photographed above). The cost for a 10'' individual socca dish is $9.75. And even better is that they offer free delivery between 48th and 66th streets ranging across from 2nd to 7th Avenues. Are you looking for a delicious, nutritious bar that will keep you feeling full and satisfied for hours after indulging it? Well, then you must try thinkThin bars! As the company states, they are created for those who "think about what they eat." 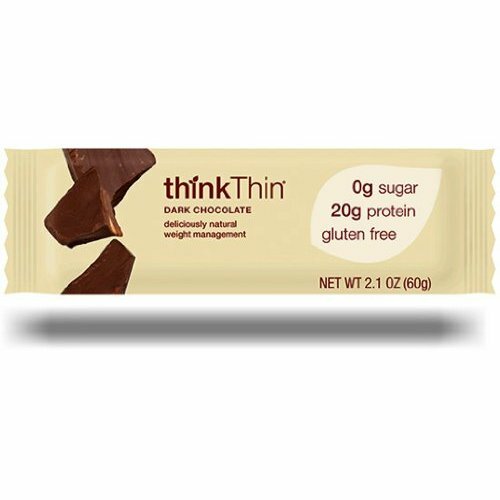 thinkThin bars are gluten free and sugar free! Plus, they are one of the only gluten free bars on the market that are extremely high in protein! Each bar contains 20 grams of soy and whey protein combined with calcium caseinate. They are fortified with 17 essential vitamins and minerals and they contain absolutely no trans fats or cholesterol! thinkThin bars are available to purchase at Whole Foods and other health food stores. You may also purchase them on the thinkThin website or at Ms. Celiac's Market! And make sure you follow them on Twitter at thinkProducts!